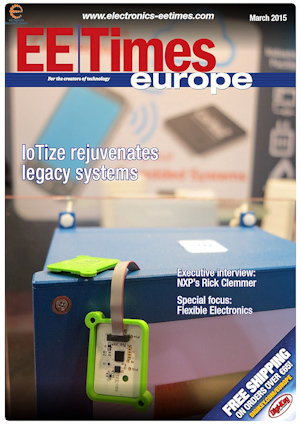 1 March 2015, Montbonnot France – The March 2015 issue of EETimes Europe includes a highlight about IoTize™ for retrofitting IoT connectivity to existing systems. This interview with IoTize™ inventor, Francis Lamotte by EETimes editor Julien Happich focuses notably the advantages IoTize™ offers legacy appliances and systems. Designers of these systems can add smartphone connectivity via NFC or Bluetooth, without modifying the firmware or hardware of the original system. The interview and demonstrations we conducted at Embedded World, a leading trade show for the microelectronics industry which is held annually in Nuremberg Germany. This cover article is available online at the eeNews website.